Ironclad is a cooperative space opera game for 1 to 3 players currently on Kickstarter from Alcyon Creative. Players take control of the Ironclad, a warship that defected from Gaia Nova Federation Navy and now freelances to the highest bidder. Taking place over 10 campaign scenarios, players must complete missions, upgrade the Ironclad, and make choices that will have consequences throughout the rest of the campaign. Over the course of the game, the Ironclad will move through space dealing with environmental challenges, resolving Intel missions, taking care of the crew and ship, and combating enemy forces. This breaks down into 3 core actions: Recon, Movement, and Resting. The number of actions the players get per turn is based on the Crew and Morale stats on the ship mat. Recon – Lets you flip an adjacent Intel tile to see what it is. Move – Moves the Ironclad to an adjacent sector. Environmental effects are resolved, then the Intel tile on that space. The Move phase is where most of the action of Ironclad takes place. Intel tokens reveal various Operations or Combat missions that players will need to overcome using their Heroes, Fighters/Mechs, and the Ironclad’s systems themselves. As the players move through each scenario the Ironclad will become more battered, her crew more worn down, and penalties will start to add up. It’s important to keep the ship stocked, repaired, and the crew’s numbers and morale up by making sure to stop at Space Stations and spending hard-earned credits. Each Scenario in Ironclad has a bit of story to go with it. The campaign builds on itself as the game progresses and choices the players make will have an effect on the overall story, which contains multiple endings. Also, as time goes on, Heroes can be promoted and the Ironclad upgraded and modified to better ensure her survival as the players work together to solve the problems facing the ship and her crew. For more information on Ironclad and its mechanics, check out the full rules. This preview is based on the Tabletopia module for Ironclad, thus I cannot comment much on the components of the game. I can, however, comment on the game’s artwork and graphic design, both of which are out of this world. The art style harkens back to sci-fi cartoons and comics of the late 80’s and early 90’s. It’s colorful, yet somehow still bleak and almost gothic, perfectly setting the mood. Speaking of the Tabletopia module, it’s very well done and a great way to get a taste of the game. Ironclad is truly something special. It’s a complex game with a lot of moving parts that’s really just a culmination of smaller, simple mechanics that make the game easy to learn. The two scripted tutorial missions of the game both give you a wonderful feel for the mood and theme of the game, but gradually introduce you to all the game’s rules you need to know to dig right into the first scenario in the Campaign Book. There’s a learning curve here, but not a difficult one. All that’s needed it a little time to learn how things work. The game plays 1-3 players, but it’s a bit clunky with 2. 1 or 3 is highly recommended. In fact, I’d say playing the game solo is really the best experience. I only was able to run through the first scenario provided by the Tabletopia module. but it was enough to whet my appetite and make me want more. The options open to players during tense Operations are vast, though only through careful play. Managing the Ironclad, her systems, crew, and Heroes can be a bit daunting, but that flexibility/complexity is what makes the game so great. Ironclad is currently on Kickstarter, and in an amazing surprise to me, is only $35 to make sure you get a copy when it funds. This includes the base game and all stretch goals unlocked. 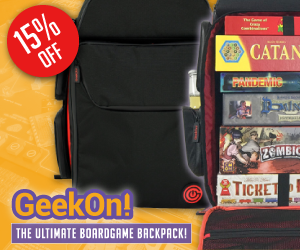 There may not be a better board game deal on Kickstarter right now.